Did I Hear You Say 'Buba' And Sneakers? Hello dearies, hope everyone is doing just fine? Here is a post to make your evening an interesting one. 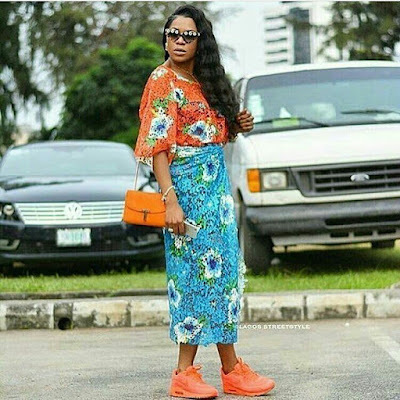 Recently style influencer, Vonne Couture rocked an outfit that sparked rage on social media, so many people think this look is a total miss. But hey, why don't anyone see things the way I do, all I see from this look is style and creativity hehehee. There is absolutely nothing wrong with this look I swear. Just because she decided to go a little overboard with her 'buba' outfit by pairing it with sneakers doesn't make her less stylish. She was only trying to birth a new fashion and style that I personally think everyone should cop. I loved the fact that she rocked those floral two piece outfit that comes with same design but in different colours and the cute colourful sneakers came rolling and added stun to the whole outfit..